Be it Instagram or on TV, pretty much everyone you see these days is sporting colored hair. 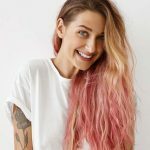 Brightly colored hair in a wide rainbow spectrum of colors can be seen on almost every celebrity and Insta-blogger out there – and we sure as hell are not complaining. Well, there are two things we’re complaining about. First, how much it costs to get our hair permanently colored. Second, the damage that it causes to our hair. But there’s one simple solution for both these problems – semi permanent hair color! Semi permanent hair color deposits color onto the surface of your hair and brightens up your mane. It does not penetrate the cortex the way permanent hair dye does. Therefore, the color you end up with will be at the same level as your natural hair, or darker. So, boo, if you think you can go from brunette to blonde in just a jiffy, that just ain’t happening. What it can do is add a bright pop of color, intensify and add a shine to your natural hair color, and cover up gray hair. While permanent hair dye can last for months, semi permanent hair dye does not have that kind of lasting capacity. It fades little by little with each wash, and is almost completely gone after 15-20 washes. Now, the hair care aisles in drugstores are stocked up to the hilt with all kinds of semi permanent hair colors. And choosing one from among them can be pretty overwhelming. But have no fear! Because I am here! With my list of top 10 best semi permanent hair dye brands that will give you the hair color of your dreams! Let’s start off with the best of the best, why don’t we? 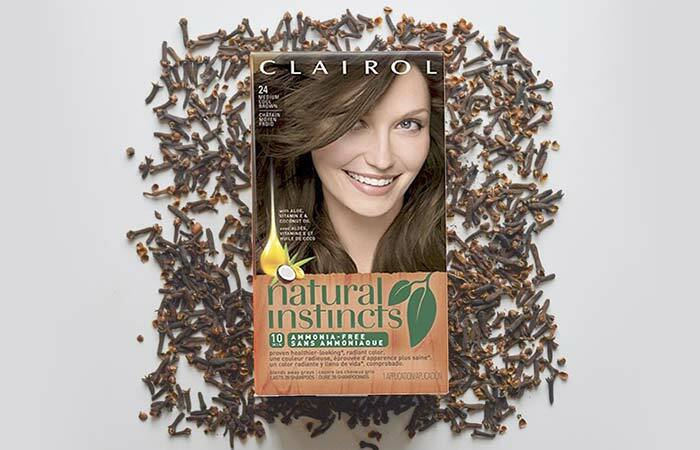 Clairol Natural Instinct is pretty much the holy grail of semi permanent hair colors. And if you’re looking to go for more natural hair colors (like brown) or to cover up grays, then this is the product you need to put in your shopping cart. Not only does it come in a whopping 36 shades and takes just 10 minutes to process, it’s also infused with vitamin E, aloe vera, and coconut oil. This makes sure that your hair is amply moisturized when you’re coloring it. Looking for a hair color that offers short term commitment, but still looks totally funky? Then L’oreal’s Colorista offering of semi permanent hair colors is what you need to get your hands on! The pastel shades of this range are gorgeous, to say the least, and come in a variety of shades of pinks, blues and greens. Not only are there 7 shades that are perfect for naturally or bleached blonde hair, the range also offers 4 shades to brunette women who would like to add a subtle pop of color without bleaching their hair. 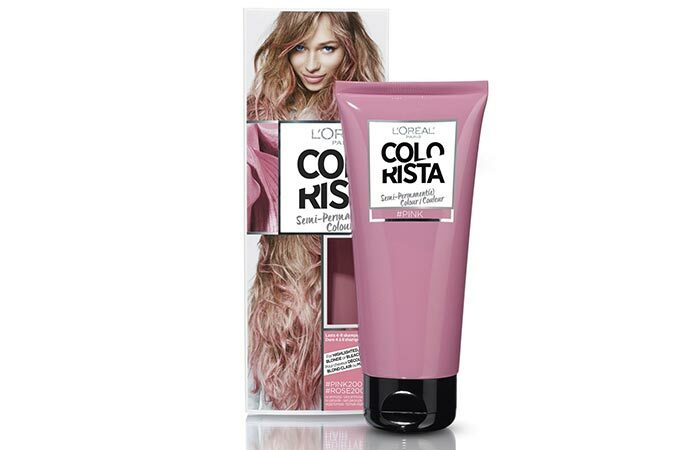 This Colorista semi permanent hair dye lasts for about 4-10 washes. Anyone who’s in the pursuit of a bold, vivid hair color job needs to check out Ion Color Brilliance Semi-Permanent Brights Hair Color. Its range of high quality, hi-fashion hair colors was designed in Italy and can be used on natural or bleached hair. Ion’s hair colors are known to be especially gentle on hair as they contain hyaluronic acid, argan oil, pequi oil, and other natural products that work to nourish your hair. They also contain 38% less ammonia. Get your hands on these bad boys if you’re looking for bright blue, pink or red shades. For anyone who is super conscious about only using products that have not been tested on animals (which should be all of us, really), Iroiro’s range of semi permanent hair colors is the perfect choice. This vibrant range of colors that comes in 14 shades is 100% vegan and cruelty free. They also contain natural organic coconut oil that ensures that your hair is moisturized throughout the coloring process. But that’s not all! 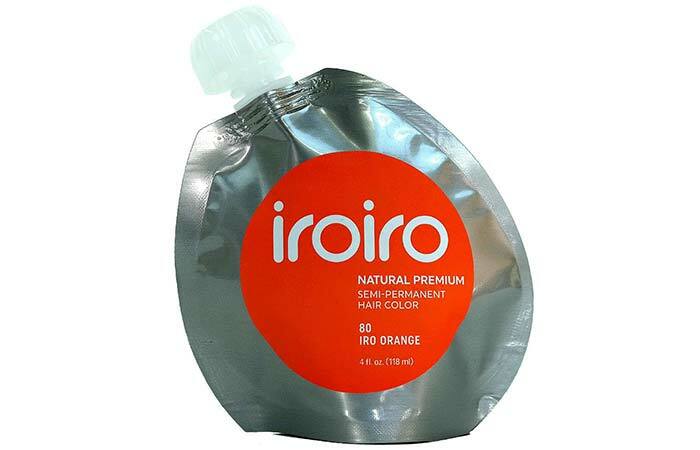 Iroiro is also committed to making its hair colors free of parabens, ammonia, peroxide, and synthetic preservatives and fragrances. Wella’s range of demi-permanent hair colors is a step above the semi permanent hair colors you’ll find in the market. This is because they last for about 24 washes and add some intense depth to your natural hair color. They are not only great for covering gray hair but also work well in toning highlights and adding deep lowlights to your hair. They also process in just 20 minutes and are free of ammonia. 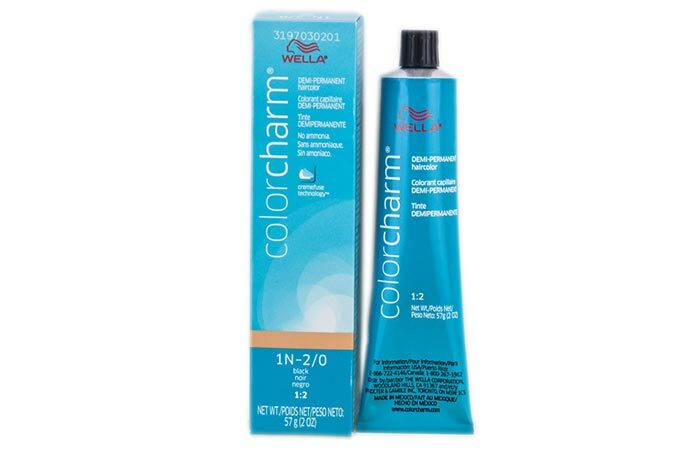 Needs to be combined with Wella Color Charm Activating Lotion (that is sold separately) for optimal results. 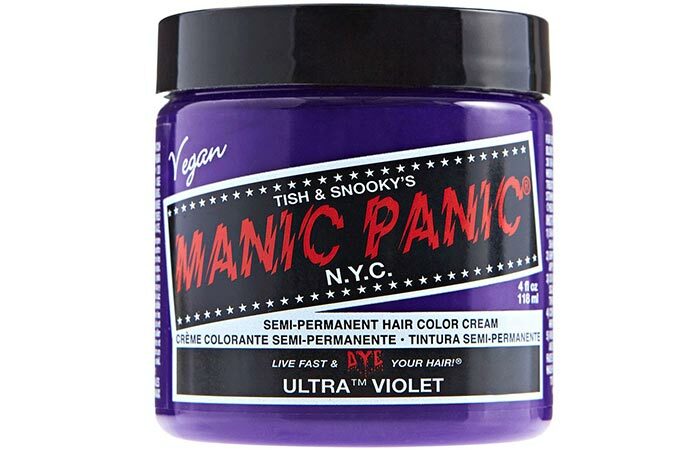 Manic Panic is nothing less than a pioneer when it comes to vegan and cruelty free products. 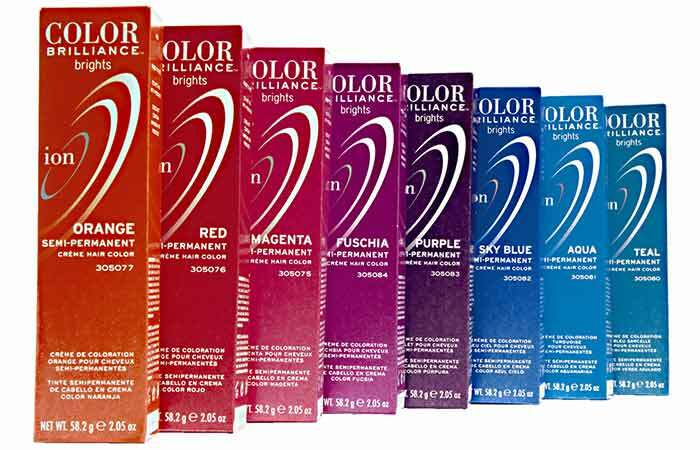 These “high voltage” hair colors (as the brand calls them) come in a rainbow spectrum of 44 shades and are known to be super pigmented. Besides having an extremely catchy name, Manic Panic is also free of para, gluten, and ammonia. So, it’s no wonder that it won NYLON magazine’s Beauty Hit List award for Best Hair color in 2017. Consider yourself an artist and love playing around with colors? 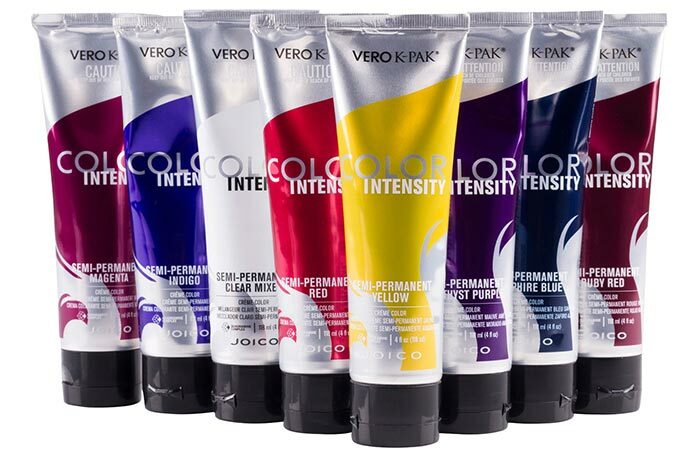 Then Joico’s range of semi permanent hair colors will definitely excite you. These bold and brilliant colors that come in a wide range of shades can be mixed together to customize your hair color and create an infinite number of shades. Moreover, the K-PAK reconstructor in Joico’s hair colors guarantees you end up with healthier hair after every coloring session. So, it comes as no surprise that its Confetti Collection won BehindTheChair.com’s Stylist Choice Award for Favorite Pastel Color Line in 2017. For anyone who believes in only using cruelty free products, Arctic Fox is the perfect choice. Started by model Kristen Leanne, this range of bright and popping semi permanent hair colors is 100% vegan and cruelty free. It also doesn’t contain drying alcohols or harsh chemicals that can damage your hair. On the contrary, it has conditioning components that ensure that your hair is well hydrated throughout the dyeing process. 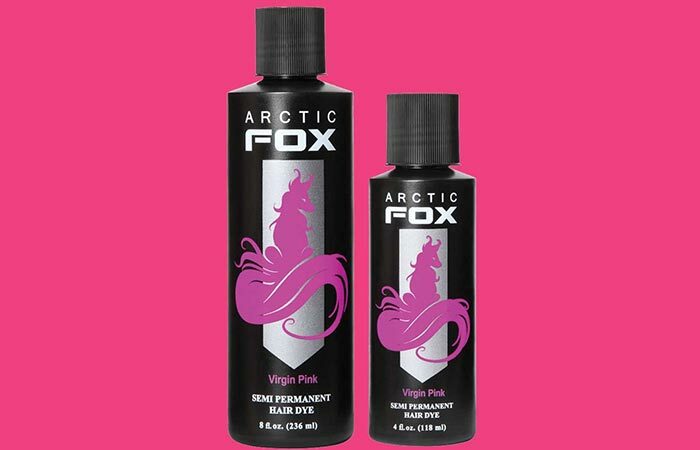 Arctic Fox also promises that your color will fade into a pastel spectrum of the same shade. And lastly, the colors smell great, which is always a plus! Dark And Lovely Color Gloss does exactly what it claims to do with its name! This range of semi permanent hair colors is aimed at black women and any woman who would like to add shine to her lackluster natural colored hair. 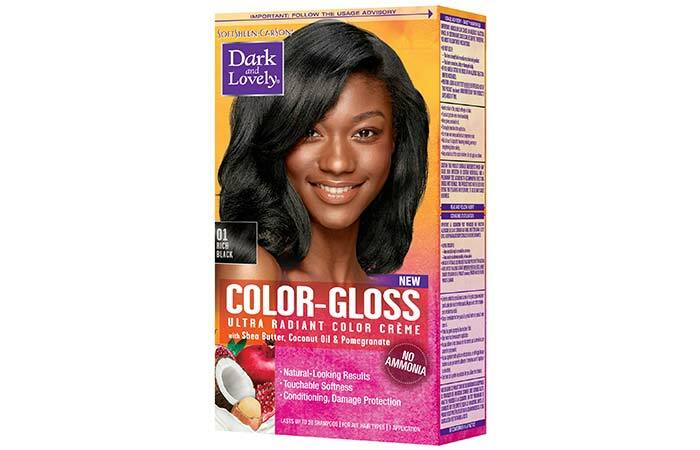 Dark And Lovely comes in 6 shades of brown and black and is ammonia free. But what makes it even better is the fact that it’s infused with tons of nourishing agents like coconut oil, olive oil, argan oil, pomegranate oil, and shea butter that condition and strengthen your hair and protect it from damage while coloring. Thus, it is the best semi permanent hair color for dark hair. One ‘N Only’s argan oil based semi permanent hair colors add intense color and shine to your hair without the use of a developer. They contain active levels of rare organ oil that nourish your hair. They are also ammonia free and take about 30 minutes to process. They come in a wide range of pink, purple, blue, and green shades and last for about 6-8 washes. Now that you’ve gotten a fair idea of what semi permanent hair color you want to go for, let’s look at how you can color your hair right in the comfort of your own home! Wash your hair with a color clarifying shampoo to remove all the build up and product from it. Do not condition it. Brush out all the knots and tangles from your hair and blowdry it completely. Apply vaseline on your ears and all along your hairline to prevent your skin from getting stained. Pick up a dollop of hair dye and run it between your gloved palms. Massage the dye into your hair as if your were shampooing it. Keep doing this until you’re sure you’ve coated all your hair with the hair dye. Leave the dye on to process for the duration of time indicated on the box. Wash off the dye until the water runs clear and then shampoo and condition it with color safe products. What is the difference between permanent and semi permanent hair color? Permanent hair color lifts the natural color of your hair and penetrates your hair shaft to add color to your hair. Semi permanent hair color, on the other hand, only deposits color on the surface of your hair shaft. Thus, permanent hair color lasts longer than semi permanent hair color. How do you use semi permanent hair dye? 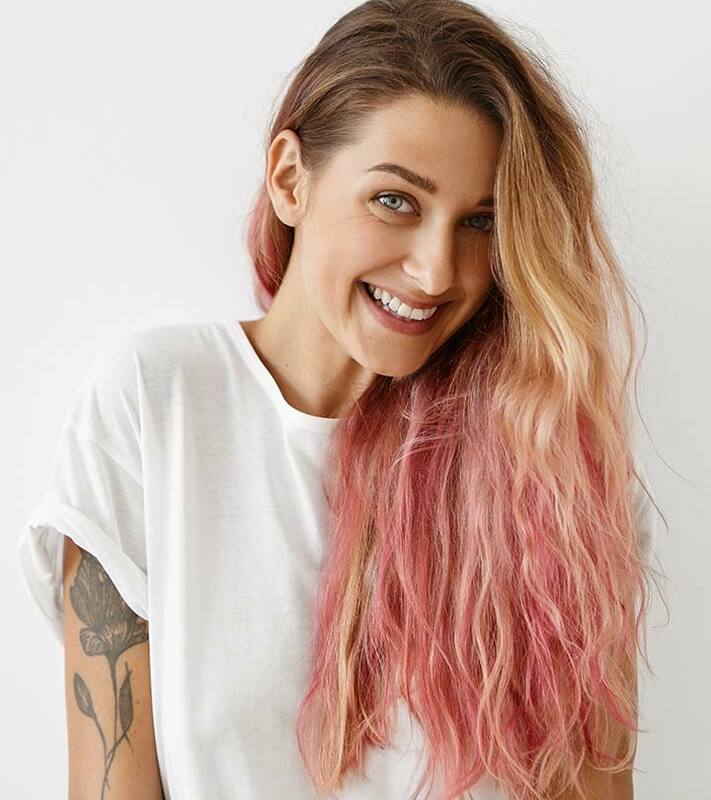 You can use semi permanent hair dye by massaging it into washed, dry hair and leaving it on for the developing time indicated on the box before washing it off. How long can you keep semi permanent dye in your hair? 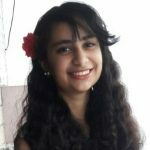 You can keep semi permanent hair dye in your hair for the developing time given on the box, which is usually anywhere between 15 to 45 minutes. How do I keep my hair color from washing out? You can keep your hair color from washing out by washing it as infrequently as possible, using color protecting shampoo, and by conditioning it regularly. How long after you dye your hair can you wash it? It’s best to wait about 72 hours (3 days) after dyeing your hair before washing it. How long do you have to wait to dye your hair after you wash it? You have to wait until your hair is completely dry before coloring it. How many times do you have to wash your hair? Wash your hair just once until the water runs clear, and then shampoo and condition it. I’m sure now you can’t wait to get your hands on some semi permanent hair color and going crazy experimenting with your hair look! So, comment below to let us know if you have any more questions!